Major U.S. banks have been rolling out new, secure smart chip debit and credit cards for months, but the real end-user impact hasn't yet been felt. Some experts say typical consumers will get confused and may even balk when first attempting to use these new "PIN and chip" smart cards, where a PIN is a personal identification number, and a chip is a computer chip that can be read by a new point-of-sale terminal. As a result, customers may choose to rely on the less-secure magnetic stripe also on the new cards for in-store purchases. Or, customers could even turn to mobile wallet alternatives, like Apple Pay or the coming Android Pay, and skip the credit and debit card experience altogether. "PIN and chip is going to be confusing. Adoption is going to be painful in the U.S. because people are so used to magnetic stripe," said Bob Graham, senior vice president of banking and financial service at Virtusa, a global IT services company, in an interview. Smart cards are inherently more secure than magnetic stripe cards. There are already 3.4 billion chip cards in circulation that are widely used in 80 countries outside the U.S., according to the EMV Connection website. EMV stands for Europay, MasterCard and Visa, the original companies that developed the chip cards. Smart cards are embedded with a computer chip that is read by a new-generation payment terminal. As with older cards, payment information is transmitted electronically over a payment network to confirm a customer has available credit or funds in a debit account. There are at least a few reasons that consumers might get confused or give up using the smart card, experts said. First, it takes longer by at least a couple of seconds to make a payment with a smart card rather than a magnetic stripe card. Also, the payment confirmation will vary by the type of payment terminal or a store's required payment procedure, which could cause confusion. Some new terminals that are designed to handle smart cards will emit a beep that a transaction is complete, while others will flash a light or a text message on a screen that signals "approved." In some other cases, a store clerk will verbally confirm that the payment is complete, which will depend on whether the sales clerk has received proper training. To further complicate matters, in some locations, smart cards will also work with new terminals that support near-field communication (NFC) technology,. With these terminals, the smart card won't have to be inserted into a slot but can tap or be brought close to the terminal for a "contactless" payment. That contactless approach is what's used with NFC-ready smartphones, like Apple's iPhone and many Android phones. Also, most retailers will still require customers to type in a PIN on a keypad or write their signature on a keypad with a stylus to approve a payment. When customers are trying to make a payment while others are standing in line, the pressure to move quickly could overwhelm their sense of needing greater security with a smart chip card. "There won't be a standard terminal at checkout, so the experience will be frustrating," Graham added. "You'll wait for an acknowledgement from the cashier or the machine that will cause friction, and that will create an opportunity for mobile wallets to advertise how easy they are to use." Bank of America is showing in TV ads how it supports Apple Pay with iPhones, Graham said. Bank of America also has been shipping new smart cards to its customers with a pamphlet explaining the new cards and how to use them. Banks, merchants and card issuers have tried to agree on common smart-card payment terminology to provide clear, simple steps for consumers via a website called gochipcard.com. 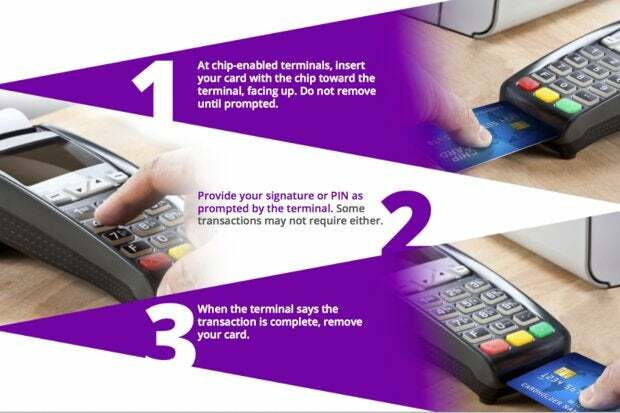 The website describes some of the basics for using a chip card, such as inserting it "with the chip toward the terminal, facing up." The description concludes: "When the terminal says the transaction is complete, remove your card." Other instructions warn, "do not remove [the card] until prompted." "We certainly don't think the consumer should fumble through" using a new smart chip card, said Carolyn Belfany, senior vice president of U.S. product delivery for MasterCard, in an interview. Part of the intent of the gochipcard.com website is to give uniform instructions supported by the industry. "It was important that consumers are given the same instructions such as not taking the card out too soon, since people are used to swiping a card and jamming it back in a pocket," she said. "You need to leave the cards in the terminal a couple of seconds until you see instructions or hear a beep," she added. "Some terminals will have a beep or not, some will be audible, some will be onscreen and some will even have video instructions. Some will prompt for a signature and some for a PIN, so there will be those kinds of variations. Hopefully that stuff will be minimized, but we'll still have variation."